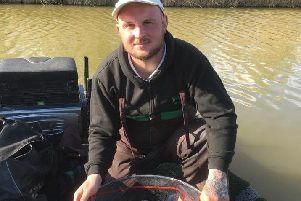 Nigel Baxter won the grand final at Float Fish Farm Fishery. The River Nene, as anticipated, was a massive disappointment to those fishing the first East Midlands Winter league match at the weekend. Little or no rain to speak of for weeks on end, cold nights leading up to the event and bright sunshine on the day gave rise to a poor result and some of those fishing were upset to say the least. There is no getting away from the fact, the full result does not look good with some very respectable anglers finding it very difficult to muster more than a couple of pounds to put on the scales. But there has to be winners no matter what conditions we have to fish under so I say well done to Browning Hotrods who came out on top, putting a very impressive scorecard in to get their new winter campaign off to a great start. On the individual front Martin Caldicote topped a big field with 12lb 5oz. His catch included a bream, a tench and a few small fish. Hotrods’ Steve Welford, who won the practice match, put a great net of 140 small fish together from C section for 7lb 10oz to take the runner-up spot. Dave Rawlings was third with 5lb 14oz followed by Trevor Oakman on 5lb 9oz. All the action now switches to Fenland waters. Next up is the North Level Drain at Tydd Gote for round two. There’s a practice match there this Sunday which should give us a clue to the venue’s current form. Saturday saw the grand final of the Float Fish Farm Fishery Summer Series with qualifying anglers lining the banks of the Two Island Pool. What a match it turned out to be with very little to separate the top three. In the end it was Nigel Baxter taking the spoils with 108lb from peg eight. Baxter was a top-quality river angler some time ago but was one of the first to migrate to commercial waters and is still a force to be reckoned with as this result proved. He caught on the feeder early in the match before switching to the pole line. Runner-up was Andy Adams on peg 31. He caught on the pole netting 100lb 15oz on pellet, then came Mark Barron, who fished the feeder and pole, for 93lb 6oz. This was a well run series by Alan Marshall and there are already plans for an even bigger and better event in 2017. There is just no stopping Chris Saunders in the JVAC matches on the Decoy Lakes complex right now. Each week the club rotates around the lakes at the fishery yet he still fishes the same method and keeps on coming up trumps. Last weekend saw him out in front on the Oak Pool, netting 177lb 15oz from peg 30 fishing cat meat on a short pole line. Dan Abbott preferred a pellet and dead red maggot attack which saw him weigh in 155lb 2oz for second place, just ahead of Andy Gausden with 149lb 15oz. He caught on a pellet bomb approach. In the regular Friday Over 55s match fished on Six Islands at Decoy it was Chris Saunders once again topping the field this time with 124lb 1oz from peg four. Runner-up was Dave Marzell with 114lb 12oz on peg 11 followed by Gus Gausden on 107lb from peg eight.